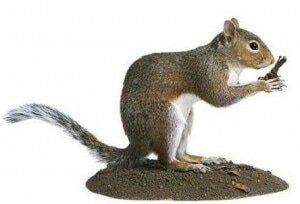 The Grey Squirrel’s body is approximately 25cms, its tail is around 20cms. They are found throughout most of southern England, Wales, some parts of Scotland and Northern Ireland. They can been seen all year round in woodland, parks and gardens. Squirrels eat mostly nuts and seeds. The front teeth of the Grey Squirrel are continually growing and to prevent them getting too long, they need to constantly nibble on something to grind them down hence the reason for their destructive nature to both urban and wildlife environments. Together with their ability to pass on the squirrel parapox virus, which is fatal to our native Red Squirrel, the Grey Squirrel earns its well deserved ‘Pest’ status. The breeding season starts in January and finishes around June. Grey squirrels have one or two litters a year, each producing between one and seven young. In areas where there is a lack of natural nest sites they sometimes move into the attic spaces of houses, where they can cause damage to electrical wiring with their gnawing habits. This can obviously create a fire hazard. The placing of purpose built traps is the most effective form of squirrel control. The traps are checked daily minimising animal distress. Once caught the Squirrel is removed and disposed of sympathetically and humanely.